This recipe by Allegra McEvedy was in yesterday’s Guardian. She says it’s “good for three days, during which time I would keep it out of the fridge, but covered, for instant passerby snacks”. Makes eight fat slices in a fluted tart ring with a push-up base (28cm x 3.5cm). Takes an hour. Pre-heat the oven to 170C/340F/gas 3. Roll out the pastry and line your tart case with it; always keep a little ball of pastry aside for emergency repairs after blind baking, rather than lobbing the trimmings. Stick in the freezer for about five minutes to firm up. 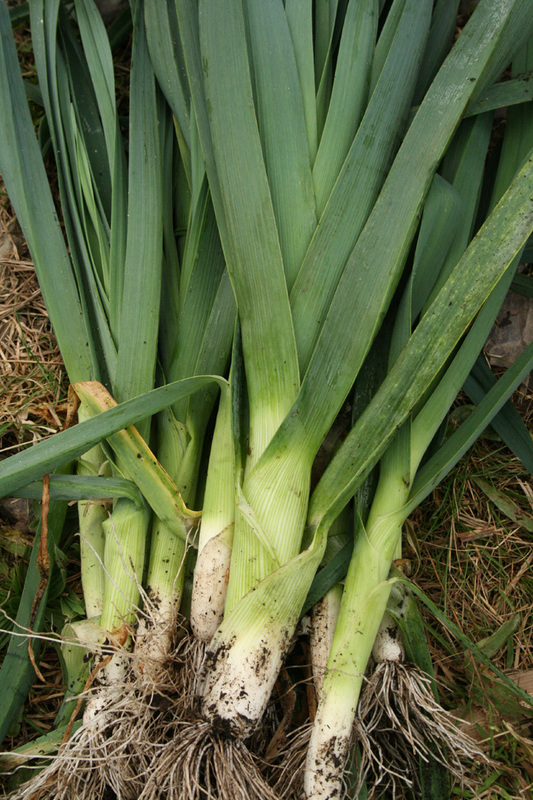 Trim the leeks; if they are thick then quarter them lengthways before slicing roughly 1cm thick, thinner ones can just be halved lengthways before slicing. Then wash them thoroughly – there’s nothing worse than biting on grit. Melt the butter in a wide pan on a medium heat, then add the leeks. 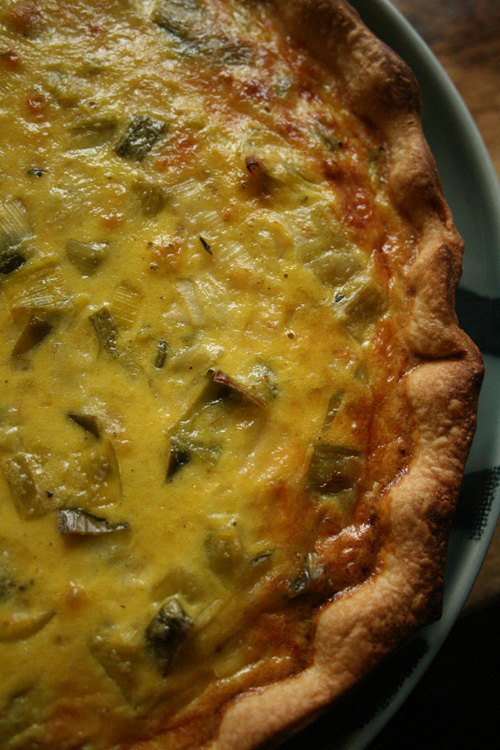 Turn the heat up to high, add the thyme, season and put a lid on. Take the tart case out of the freezer and bake blind for 10-15 minutes. Once it is beginning to brown, mix the yolk of one of the eggs with a tablespoon of cream, brush this all over the base, sides and crown of the tart and put back in the oven for a couple of minutes until shiny and golden (now is the time to plug any holes with that spare ball of pastry). Stir the leeks regularly for a further 20 minutes (keeping the lid on between stirs) or until they are well softened and all the water has come out of them. Turn the heat down if they are starting to catch. Crack the eggs into a big mixing bowl, including the lone white, and whisk in the cream and mustard. Stir in the cheddar and then tip in the hot, softened leeks, discarding the bunch of thyme. Season well, ladle the mix carefully into the tart case and cook for about half an hour, until light golden brown on top, and the egg has set. Let it sit for 10 minutes before tucking in. I noticed this recipe in the Guardian yesterday, and I’ve just made it. Luckily I had enough eggs (we have only two hens left after a series of fox raids). As it makes a big tart, I downsized it to five instead of six and adjusted the other ingredients accordingly. I used Cornish smoked cheddar from Tredigo Smokehouse, bought at St Kew Harvest Farm Shop. All my thyme seems to have disappeared this winter, so I added a very small amount of sage instead. It’s going down a treat. It’s good with Cornish Orchards cider. Oh – and the Cornish spring greens that came in the veg boxes. We made this one yesterday. Really really tasty. Yum!